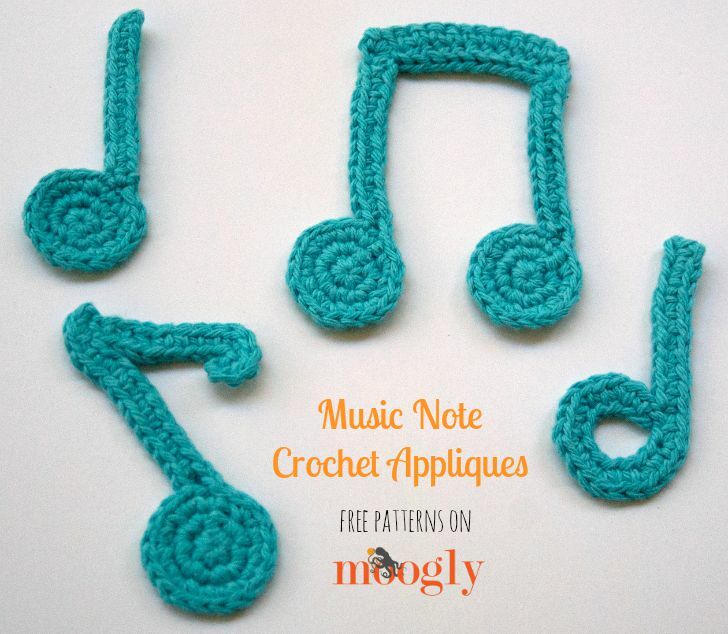 Whenever I mention appliques, I get the same request – musical notes! 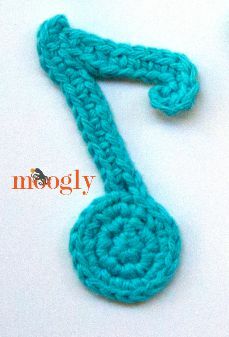 So here’s a set of Music Note Crochet Appliques to help you keep the hooky beat! 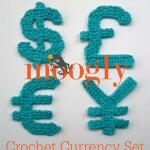 These notes were made to the same scale as the Moogly Crochet Alphabet, Numbers, Punctuation, etc. 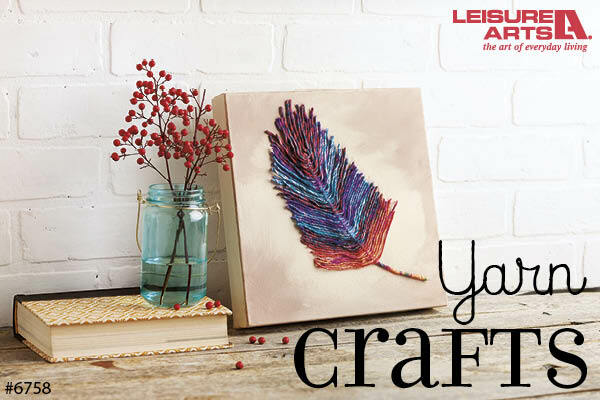 So feel free to mix and match for your own custom creations! Remember to leave a long tail for sewing on later, if needed. Please use the Print Friendly button at the bottom of this post to print a copy for personal use. However, there are links to a couple unique techniques in here, so you may wish to click on them to learn more before working these patterns from the printed page. These techniques are linked within the patterns in which they are used. The pieces here can be mixed and matched to create custom musical notation – be sure to grab the bits and pieces you need of each to create the music notes you’re looking for! Row 4: Ch 14, skip the ch closest to the hook, sc in next 12 chs (last ch remains unworked); break yarn and sew to round 3 as for a seamless finish. Ch 25, skip the ch closest to the hook, [sc in the next ch, 2 sc in the next ch] 6 times, sc in the last 12 chs; break yarn and sew 1st st to stitch #20 or as shown above. Join to chain side (right) in the 2nd st from the top of the vertical line; ch 12, skip the ch closest to the hook, sc in the next ch, 2 sc in each of the next 2 chs, sc in the next 4 chs, sc2tog, sc in the last 2 chs, sl st in the next (top) stitch of the vertical line; break yarn and finish off. For a Sixteenth Note/Semiquaver, add another flagged piece, below the first in the Eighth Note above. For a Whole Note/Semibreve, click here for the “o” in the lowercase alphabet, or make the Half Note/Minim starting with a ch of 12. For a flat, flip the Half Note over, and for a sharp, click here for the “hashtag” in the punctuation set. 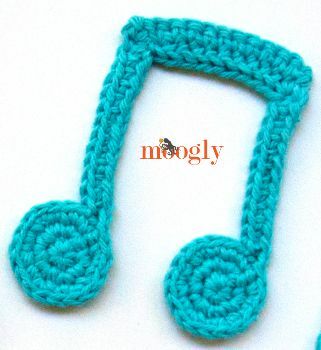 I hope you enjoy this set of Music Note Appliques! 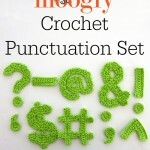 I can’t wait to see how you use them to express your own creativity! Ooooh i was waiting for this pattern for years, thank you very very much! 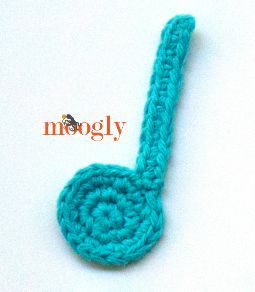 As a hobby musicien and crocheteress i really am happy! 😀 I’m so glad, thank you! j’aime vraiment ce que vous faites c’est merveilleux. Thank you Pamela! I was going to try, but the nature of the stitches was making it too large. I may try again at a later date! Thanks for replying. I appreciate all you do! 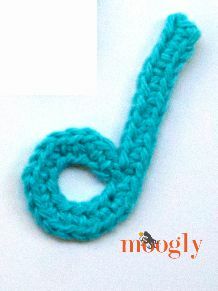 Thank you so much for the music notes.I love them and will make them very soon. Thanks again. 🙂 Thank you Eleanor, I’m so glad you like them! Thank you and my granddaughters thank you too!! Tamara I’m making a sheet music afghan for my niece who plays the viola and I was looking for these notes. Thank you so much!!!! Oh perfect! 😀 Glad they were ready when you needed them! these patterns were just what I was looking for!! And the fact that they were shared for free made it all the more awesome!!! Thank you for assisting in the completion of my project! I’m so glad you found them when you needed them! 😀 Thank you so much Roz! Love these – haven’t made them yet but I thing they’ll be perfect for my blind piano student, who is super curious about what things look and feel like! I, too, was wondering if patterns are available for treble clef, bass clef, sharps, flats and other music symbols. Also, what’s the approximate size of the notes? 🙂 Hi Laura! Thank you! 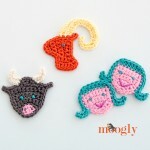 The size will depend on what yarn/hook/tension you use, but they are around 3-4″ tall. I don’t have any other musical appliques at this time.